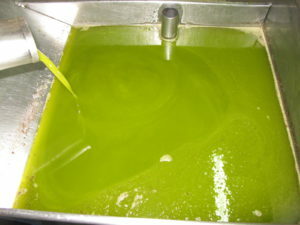 The oil of the Cooperativa de Ulldemolins is virgin oil of extra quality, obtained by mechanical procedures that do not produce any kind of alteration of the oil, preserving its flavor, aroma and characteristics of the fruit. The oil is mainly composed of fatty acids and the rest of the components (from 1 to 3%) are those that define their color, aroma and flavor. Flavor intense fruity green, bitter and spicy in the mouth (without being unpleasant). Although it has a certain level of sweetness, it is hidden by the astringency and bitterness it presents. Secondary aromas of green type (very clear herb, but also artichoke and almond, with touches of tomato and green banana). The overall feeling is of a very intense oil, but a little “hard” in the mouth. It is worth highlighting the intensity and richness of fruity, which explains the clear connotations of vegetables that it presents in the mouth. It is an excellent oil. (Comment on the descriptive profile of the Pannell de Catalunya) . Decreases the levels of cholesterol in the blood. Protects certain types of cancer. In addition the oil is a source of beauty : mixed with essences or aromas has been used as a moisturizer, it also provides brightness, vitamins and prevents the hair open ends. It is an embellishing and toning skin. The Regulatory Council of the Protected Designation of Origin Siurana is the body created to control and guarantee that the oil used under this name has been produced in the area of ​​it, prepared in compliance with its regulations and controlled according to its parameters of Quality, and all in accordance with its regulations (Ministerial Order of 19-11-79. BOE 13-12-79. Regulation 2081/92 of the EU Council). It is a collegiate administrative body, constituted democratically by representatives of the production, processing, marketing and export sectors of the production area. Produced in the geographical area covered by the Designation. Made according to its own regulations. Controlled according to its quality parameters. The area of ​​plenty, storage and packaging is integrated by the municipal terms that form the geographical area of ​​the Denomination.